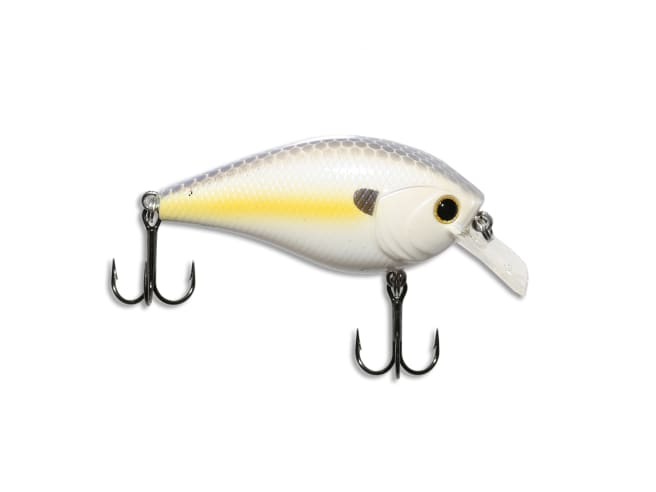 Karl’s Amazing Baits Golden Boy is your new favorite squarebill crankbait. Karls’ favorite sports to throw The Golden Boy is near hard cover, docks, brush, or rock piles. The body is a tough cookie, that’s how he got his name, so don’t be afraid to deflect it off the hard stuff to imitate a wounded, fleeing baitfish. Pro Tips: Goldie Lock’s favorite bait - not too large, not too small - JUST RIGHT! One of the most time-tested hardbait designs, the Golden Boy is a workhorse. The bill is thin enough to have lots of great, hunting action, but strong enough that it doesn’t break or wear down after grinding it on rocks or slamming it into docks. The hooks are sticky sharp, and there’s no need to have a strong hookset. Use a moderate action rod, which is more foregiving and will prevent you from ripping the hooks out of the fish’s mouth. Plus, when a big one gives you a headshake, you’re more likely to keep it buttoned up. Use fluorocarbon when fishing the Golden Boy around rough cover, but opt for monofilament if you want a little extra stretch to keep fish hooked.